Maritime industry power systems are large systems with complex hierarchical structures. The failure of one element leads to break-down of all the whole structure. And first of all this applies to power transformers. They make power systems reliable, functioning and providing adequate power quality to electrical objects. The causes of failure of power and oil-filled transformers are identified in the wear and tear of paper insulation and aging process of oil, the reliability of which determines the entire life of transformers GlobeCore Clean Marine is designed to be used in marine environment for cleaning transformers oils from water, gas and solids. The equipment is compact, easy to operate and maintain. Thermal vacuum cleaning of oil eliminates the need for sorbents, or other materials that require disposal or storage in marine environment. After the first treatment – oil has gas content of not more than 0.1% , moisture content not more than 5 g / t and Class 9 filtration by ISO 4406 Clean Marine is issued in a waterproof case, so it can be installed in wet rooms and on open decks. Explosion protection allows you to use the equipment where there is flammable substances or there is a possibility of explosive concentration of dust. 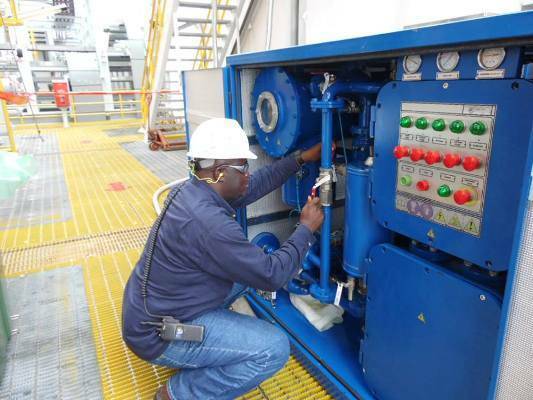 The plant can be used for cleaning insulating oils on ships, offshore oil platforms and wind power mills, as well as in the docks where the ships are constructed and repaired. Processing insulating oils with GlobeCore equipment on schedule – allows to extend the life of power transformers, saves financial costs and improves power supply in maritime industry.